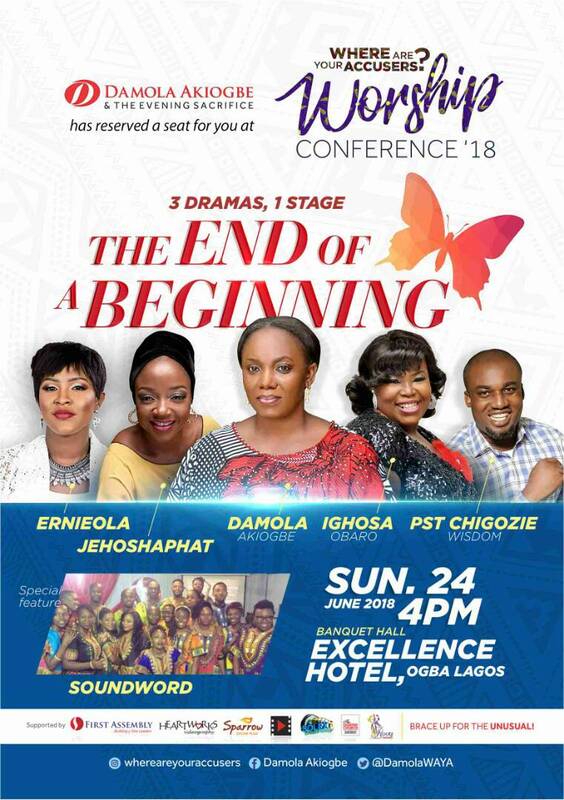 Damola Akiogbe and the Evening Sacrifice present The Worship Conference 2018, tagged THE END OF A BEGINNING. This year's edition is going to be taking an unusual dimension, with 3 Dramas in one night combined with the Word and spiritfilled worship from anointed ministers of God such as Pastor Chigozie, Ighosa Obaro, Pastor Steve Akoni, Jehoshaphat, Erniolah, SoundWord Choir of the First Assembly Ministry and the convener herself Adedamola Akiogbe. VENUE: Excellence Hotel, Ogba, Aguda, Lagos, Nigeria.